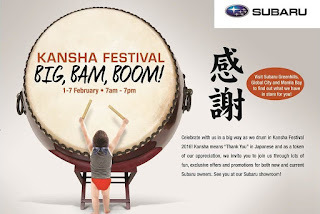 Motor Image Pilipinas Inc. (MIPI), the exclusive distributor of Subaru vehicles in the country will hold its much awaited Kansha Festival from February 1 to 7, 2016. Also known as Subaru customer appreciation week, the Kansha festival is originally a celebration adapted from the Japanese “Kinro Kansha no Hi” or Labor Thanksgiving Day. 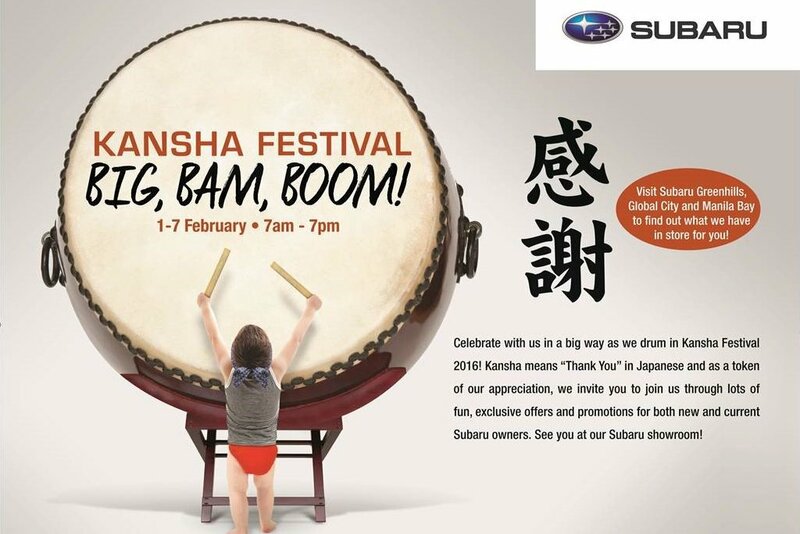 In observance of this Japanese holiday, the 7-day Kansha Festival follows the spirit of thanksgiving by dedicating the occasion to their valued customers, in which Motor Image Pilipinas will be giving away exclusive offers on selected Subaru accessories, parts, aftersales service and even Subaru merchandise items. Along with this, there will be a service clinic that will be providing free 25-point Safety Check-up when you visit any of our showrooms in EDSA Greenhills, Global City, and Manila Bay from 7:00 AM to 7:00 PM with your Subaru vehicle. The week-long Kansha Festival will also consist of different attractions for the whole family. Selected Subaru showrooms will be decorated with Japanese-inspired ornaments and an array of food to choose from will be available as customers patiently wait while their service advisers cater to their vehicles. For all Subaru owners, make your reservations now and visit us in EDSA Greenhills, Global City, and Manila Bay showrooms. Normally, they'll have special offers on new models so it's also a good time to shop for a new Subaru. However, based on this information given to us, it's just for Subaru owners and only applicable to Motor Image run dealerships. I've been there before. Non Subaru owners are also invited to participate. There are free food, drinks, etc. If I can remember well, they also allow test drive of all their cars.